Letters to a Friend is a series of paintings created by Craig Carlisle in response to the sudden loss of his best friend of 25 years. 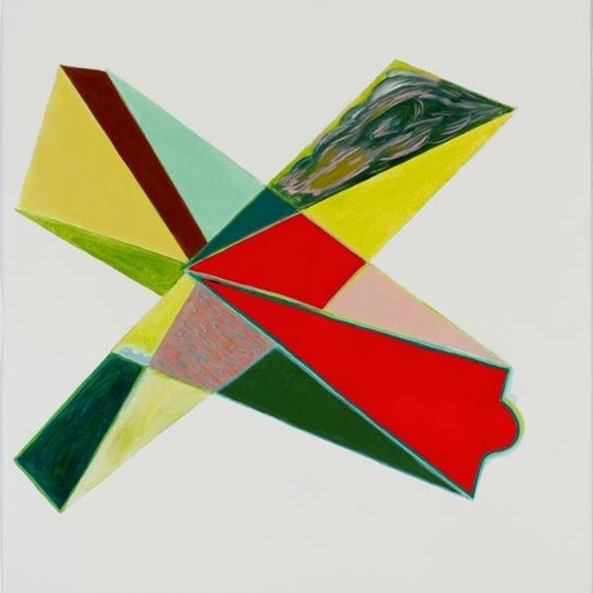 To date, the series includes thirty works, which will be shown for the first time in two consecutive month-long exhibitions of fifteen paintings. Including work by artists who value play and the role of playfulness in Art. Paintings, drawings, sculptures, sketchbooks, a quilt, costumes, pillows, and miniature food. Including new ceramic works by Ashley Atterberry, custom jewelry by Ruby Jack and a CBD Rainbow Sparkle Bark collaboration with our pals over at Bang Candy. with a special live performance by Dan Melchior, Hamish Kilgour and Paloma Dare at 7:00p. Josh Elrod is a Nashville-based artist. His process is anchored by experimentation and daily practice, which has resulted in a diverse body of work ranging from large-scale paintings to intimate drawings. Through repetition and the physicality of painting and drawing his work becomes a meditative practice, unleashing and reiterating imagery and themes from his subconscious. Several of Josh’s paintings take on a performative quality: a single contemplative gestural line executed with the artist’s non-dominant hand. 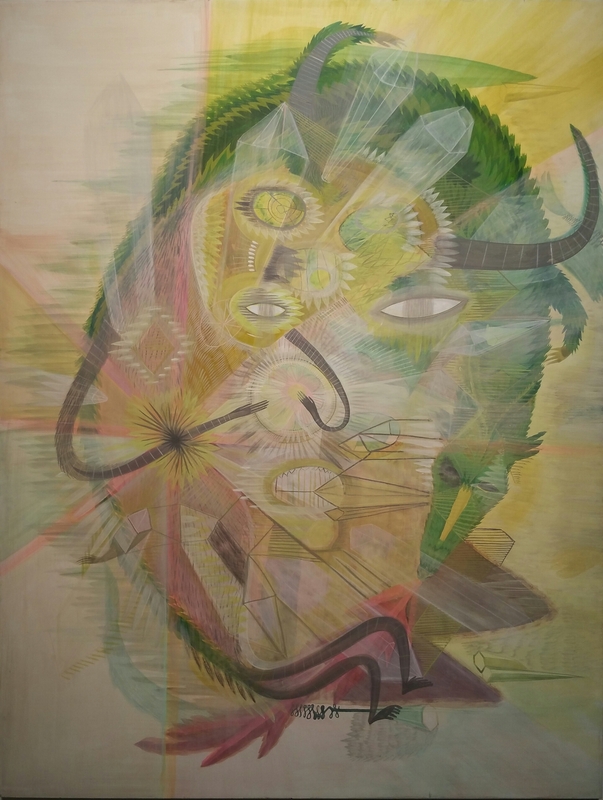 His recent body of work has varied from these single-stroke large-scale paintings to densely layered surfaces grappling with themes of chaos, sexuality, cartoon vernacular, cash machines, UFO sightings, orifices, creatures and masks: “a grotesque carnival of people, energy, machines and colors.” Josh, who studied at the Art Institute of Chicago, has exhibited work in New York, Los Angeles and Nashville. Josh relocated to Nashville from New York City after living there for nearly 20 years. The move prompted a resurgence in his creative output and the ability to work in a larger scale than ever before. Josh is an accomplished musician and performed in numerous dub, noise and pop groups; he also spent 10 years performing as a Blue Man in the critically acclaimed Blue Man Group. Josh and his wife Ivy are the founders and creative directors of Nashville’s conceptual design showroom, Wilder. Painting for me is disembodying, I aspire to become a conduit for some kind of hidden expression. I hope to transmit something of the spiritual experience I have of making the painting: a record of the act, its transitory existence. I’m drawn to the mystery of the cosmos, my inner life, the idea that there might be parallel and possibly overlapping realities and the comical vessels we inhabit. If I understood it at all, I probably wouldn’t make art, I’d just go fishing. "What is Love?" is a diverse and thorough examination of the inexplicable thing that makes us all tick. With this lush body of new work, Olivia Leigh Martin returns to her one true love: the landscape. Rich, dancing textures reveal the artist’s inner nomad. Rambling from the bayous of her native Louisiana to the beaches of New England, and the mountains of New Mexico to the misty glades of Scotland - these paintings interweave connections between the visual and the tactile, landing somewhere between memory and desire. Through Artifacts of Return, Martin argues for a species of landscape painting that offers viewers a portal into the sensorial experience of the land itself. Thin runnels of translucent color, dry pigments scraped over pocked surfaces, and thatches of topographical paint allude to the physical conditions of the landscapes in which she works. More than that, these works examine the ways in which a landscape painting may also serve as a kind of talisman for a place, one in which the remembered sense of a place may become reality. I have a deep hunger to reach out and touch the land, and not let go. This is probably a neurosis rooted in the fact that my home state, Louisiana, loses about a football field of land per hour to coastal erosion. I was in college, working on a summer coastal painting project, when I realized that the places I was painting may not exist in the future. Some of them no longer do. It was through these experiences that the fervent desire to hold onto a place through my paintings took hold of me. Of course, this is total hubris. The landscape, being infinitely vast, is also by consequence infinitely ungraspable. A painting, on the other hand, is. Observations, whether from the color of the sky to the weight of the air, from the sandy feeling of the cracked earth to the rough whip of the wind against my face, can all be set into the DNA of the painting through material and mark. It is therefore through the portal of the painting that I invite others to enter the landscape. I am a return painter. What this means is that I return to the same places over and over again, like a moon orbiting a planet. Each time I return to the bayou estuaries of my childhood, or the gorge in New Mexico overlooking the Rio Grande, my understanding of that place is compounded. I like to return, reach out, and make the attempt to touch the land again. “Bench” is an inadequate term considering the immediate centered and grounded sensation I received from simply having a seat on this inexplicable design. Tony Baker has put heart and soul into what I now consider the ultimate perch for viewing art. I invite you to come experience STAY for yourself. These hand crafted, customizable gems will also be on display through the end of May. Rachel Wayne of Daily Bloom Floral Styling & Studio will exhibit a site specific floral installation in response to Artifacts of Return. I seek to reveal the fleeting, yet resilient beauty of the living medium of flowers. By incorporating the vibrant colors, cultures, movements, & textures that surround us daily, I attempt to reveal how each bloom, like us, has inherent purpose. Regardless of color & form - from life to death, there is beauty in the process. In the last year Brett Douglas Hunter has relocated to Nashville, completely transformed his studio practice and taken this city’s art scene by storm. His newest series, CHEERS - titled after his grandmother’s pronunciation of the word chairs - explores functional sculpture with a focus on furniture. You guessed it, there will be chairs among a plethora of magical inventions. It is our sincere pleasure to bring you CHEERS! Performance art meets artist talk as Cat Acree sits down to interview the many sides of Brett Douglas Hunter. Acree lead readers through Hunter's bizarro world of folk art in the latest cover feature of NATIVE. Join us in the gallery at 6:30p on Thursday, March 8, for this one of a kind talk. We'll save you a "cheer". Julia Martin’s anticipated solo exhibition Hypnagogic, marks a turning point for the artist. Titled after the moments before sleep where hallucinations and inexplicable events are sensed, this show illuminates the subconscious voice, inviting viewers into conversation. Martin visually allows herself to break past reservations and ask important questions. Her style, freer and more animated than in past works, explores the concept of achieving clarity through relinquishing control. As a hypnagogic event provides a glimpse into the subconscious, this exhibition introduces a refreshingly unrestrained portrayal of an artist seeking truth. Multi-instrumentalist, producer, and composer Larissa Maestro has composed a piece of original chamber music to accompany the first thirty minutes of our opening reception for Hypnagogic. The performance will take place promptly at 6:15p. Players will circulate among viewers for a truly unique audio-visual experience. Attendees are asked to arrive at 6:00p sharp, silence their phones, grab a glass of champagne and immerse themselves into what is sure to be a magical and memorable evening. Post performance, opening reception continues until 9:00p with refreshments provided. Join us at 6:30p on Thursday, December 14th for an Artist Talk with Julia Martin on her latest exhibition Hypnagogic led by arts writer Cat Acree. Acree's acute grasp of this work and artistic chemistry with Martin, reflected in the featured article of NATIVE's November/December Issue, are sure to create an evening you won't want to miss. Join us at 6:30p on Thursday, January 18th for an Artist Talk with Julia Martin on her latest exhibition Hypnagogic led by artist/writer/professor Noah Saterstrom. Noah shared his insights on Hypnagogic in the first 2018 issue of Nashville Arts Magazine. You won't want to miss this discussion between two of our favorite artists. Devin Goebel is a Dadaist at heart with his playful spirit evident in everything he creates. The sophistication with which he consistently turns logic on its head is something to behold. Goebel's work turns the most mundane of cast-aside objects into comically oversized, elegantly simplified, works of genius. Yard Sale, his first solo exhibition at JMG, unites viewers in an absurd and wonderful dream, reminiscent of a classic thrifty hunt. The kind filled with all too familiar cast-offs: the old “Mr. Coffee” coffee maker seen seeking refuge on the bottom shelf of virtually every thrift store in America, that vase you've encountered at so many yard sales, or an old brass lamp so commonplace it has become invisible. Goebel's re-imagination of these routine baubles and signs will make you feel a little like Alice stepping through a thrift-ed looking glass. 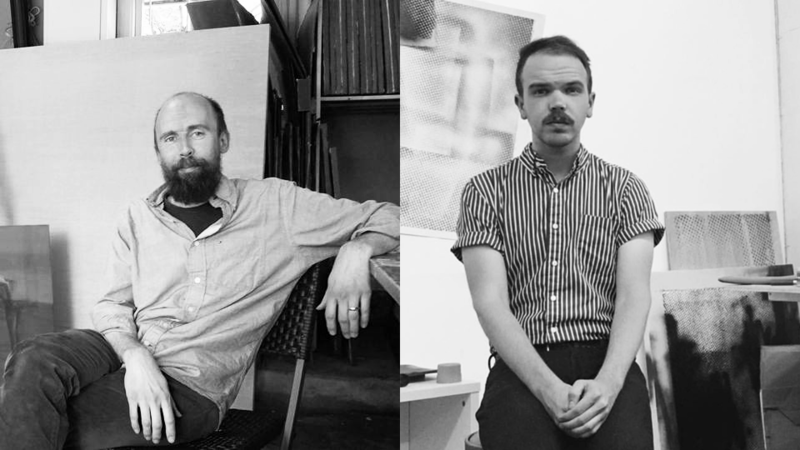 Join us on Friday, October 13th for an Artist Talk with our featured artist, Devin Goebel, led by artist/writer/professor Noah Saterstrom. Noah wrote a feature story on Devin Goebel's Yard Sale for the upcoming issue of Nashville Arts Magazine. He also kicked off our 2017 programming with one of our city's most important shows to date, Shubuta & Other Stories. You won't want to miss this discussion between two of our favorite artists. DURING A TIME OF CULTURAL DIVIDES, CAN YOU BRIDGE THE GAP? BUY A VASE, PASS IT ON, START A CONVERSATION. Twelve regional artists have created handmade vases to help bring people together through this interactive art experience. Connecting Through Clay will run October 7th through November 27th at Julia Martin Gallery, opening as part of American Craft Week, Tennessee Craft Week, and the Wedgewood/Houston Art Crawl. Participants are encouraged to purchase a vase and in 30 days give it away. The person receiving it should be someone you would not normally give a gift to - a long lost friend or relative; someone with opposing religious beliefs or political views; someone from a different socioeconomic group, racial background, or sexual orientation, etc... The recipient will enjoy the vase for another 30 days, then give it away again to a third person who keeps the vase forever and hopefully shares the story. Each owner is encouraged to do so and start conversations to help bring people together. This month we hand over our space to these five incredible local fashion designers and makers. September 2nd, coinciding with the Wedgewood Houston Artcrawl, will kick off a month long Designer Pop-Up for you to come spruce up your Fall wardrobe. Opening night will feature the DJ stylings of DJ DOUG. A multi-sensory experience involving music, video, fashion illustration, scented goodies and a limited edition "Mixer Elixer" by Bang Candy Co. make this an event not to be missed. Designed by Leslie Stephens, Ola Mai is produced in Nashville, Tennessee. Exuding elegance and flow the Ola Mai line inspires every woman to express herself freely and with great joie de vivre. Ethically and locally produced in Nashville, with her carbon foot print in mind, Dominican-American designer Maria "Poni" Silver started BBMS in 2011. Black by Maria Silver specializes in contemporary women's streetwear that combines urban nonchalance with easy glamour. Designed for the modern voyager, BBMS uses mostly recycled and overstock fabric providing a travel-ready wardrobe for the woman with effortless magnetism and attitude. Any Old Iron is a music inspired Rock n Roll clothing line designed by Andrew Clancey out of East Nashville. Focusing on men and women's tailoring with a twist, Clancey's collections aim to bring out that inner rock star. Lovingly embellished up-cycled denim jackets designed by Nashville’s very own Sandra Costa. Designed by Laura Citron, Opium is a Nashville based clothing brand for all the Disco Dolls! Shelby Rodeffer is a Chicago-based painter and commercial artist who will contribute her gorgeous "Honesty" banner (available for purchase). Raised in Nashville, Tennessee, she embraces the human hand in both her personal and professional work. Inspired by folk art and traditional sign making as a means of communication, Rodeffer combines the two creating a practical form of artistic expression. Look for her magical touch in numerous public art projects. Kat Ryals's Holographic & three dimensional Disco Orbs will be a dreamy visual element this month, along with a spectacular video installation based on her otherworldly body suits. And last but not least, video artist and improvisational dancer, Laura Cavaliere will grace us with a few of her spontaneous dance pieces along with a beautiful video installation opening night. BEVY is Julia Martin Gallery's annual summer group exhibition, showcasing some of the best up-and-coming local and regional artists. The central piece to Brett Douglas Hunter’s work for this show is a truly bizarre and wonderful self portrait based on a painting his mother made of him in 1984. Brett comes from a long line of artists that have instilled a deep love of creativity and freedom in him. These recent works pull directly from those family ties. Clint Colburn works in a variety of mediums ranging from painting and sculpture to photography and collage, sandwiching just about everything in between. His work is visceral and non-formulaic. He describes it as the harnessing, channelling and release of energy. Georganna Greene, seeking visual and historical balance on a personal level, has created an achingly beautiful body of abstract paintings that explore energy, renewal, memory and familiarity. John Paul Kesling works intuitively. His paintings house luscious textures built up over many chaotic layers of rich, free wheeling brush strokes. Somehow the finished product is always a cohesive wonder of otherworldly magic. Kevin Reilly’s new work explores the imprints left on his psyche by a Roman-Catholic upbringing and the belief systems attached to the saints that still influence the mind of a non-practicing Catholic and self-proclaimed non-believer. As part of a larger effort to understand these ties, Reilly has created a few of his own saints. Olivia Leigh Martin works in oil on stainless steel to explore the intersections where memory meets fantasy. Referencing old knick-knacks, family photos and the lush Louisiana landscape of her upbringing Martin’s paintings are a whirlwind of abstraction, gently tethered to reality by these talismans. Rebecca Blevins’s ceramic sculpture work began as purely functional; cups, bowls and everyday objects. Her newest body of work is an exploration in assemblage and elevated objects. Each piece is all at once sleek, playful and elegant. Jessi Zazu has been a staple of Nashville's music scene, a social justice advocate and an across-the-board creative force for many years. If you're not familiar with her story, you will be very soon. Look for features in the upcoming issues of Nashville Arts Magazine, The Nashville Scene, Native and The Tennessean. Jessi and her mother, Kathy, have long looked to creativity and the visual arts in times of struggle. This past year brought with it an intense battle for Jessi against an aggressive form of cancer. The battle continues and through it, in tandem, these women have created two powerful bodies of work. We've chosen Mother's Day to announce this special, pop-up exhibition. The proceeds will go towards mounting medical bills and hopefully inspire any and all who have faced similar battles, or battles yet to come. *** We would like to request that attendees forego any perfumes, scents or colognes *** Ongoing treatments have made Jessi extremely sensitive to smells and we want her to enjoy herself as much as possible. 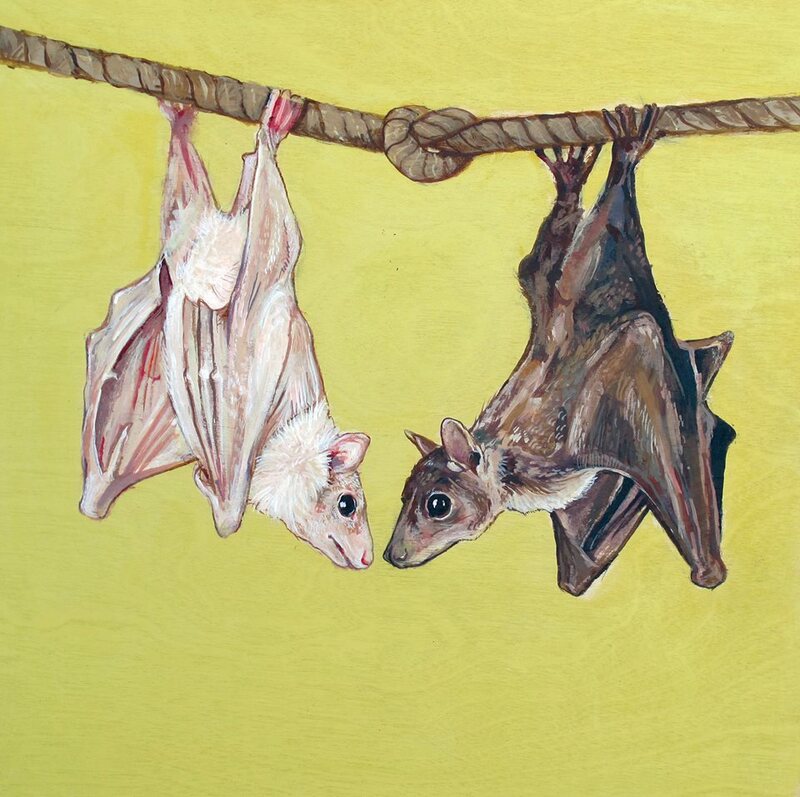 JESSI ZAZU'S STATEMENT: When my radiation oncologist asked me to create artwork for the room where I had received brachytherapy radiation, I was honored, but I also felt a great responsibility. I thought about the challenges I had faced before ever reaching the room, and how every woman who ends up there has already survived a long and sometimes painful journey. I remember the anxiety that ran through my mind during the first session. My eyes darted around the room, looking for something to help me gain mental footing to get through. All I could find were a few security cameras, beige wallpaper and outdated paintings. The session only lasted eight minutes, but I felt isolated. I was alone in a lead-lined room, hooked up to a powerful machine with lots of lights and noises. I brought my sketchbook in with me a few times, and even though I was partially immobile during the radiation, I laid back and drew everything I could see. Making art helped me get through that experience, and I created these pieces to give hope to anyone who spends time in the room after me. A wise woman once asked me, "Do you know what self-efficacy is?" I didn’t, but when I learned that it meant believing in one’s ability to succeed, I realized I needed to nurture it in myself. In that moment, I chose to see beyond my personal series of unfortunate events and connect to the human condition. Life happens to all of us, we all face challenges and setbacks. It is how we react that defines us. We have a lot more power than we think we do. We also have a lot less power than we think we do. Fighting cancer has been an education in knowing when to push back and when to surrender. By choosing positivity and love at every corner, I decided to triumph, even in my own defeats. KATHY WARINER'S STATEMENT: We found out a year ago that Jessi was sick, quite a shock. I decided from the start that I had two choices, to be positive or to be negative. We spent the whole year trying to stay up and keep distracted. Jessi had a studio at one end of the house and I had mine at the other end. The experience [of Jessi’s illness] was getting so intense that I started painting in every spare moment I had. It wasn’t long before my nightmares and sleepless nights went away. My attitude was better and I could breathe. My art became about healing and not feeling hopeless, and about celebrating life. CLICK HERE TO SEE ALL PIECES IN THE SHOW. UNDEFEATED is made possible by the generosity of Midtown Printing, Woodcuts Framing Gallery and Kangaroo Press. Standing on the edge, I observe interactions. I seek to identify quiet moments from within larger, more complex situations, focusing on chance meetings in groupings and gatherings, and searching for interaction or disconnection. These placeless figures are suspended in fields of color that serve as psychological spaces. It takes on a presence that is unsettling or cloying or comforting. It presses against them and threatens to swallow them. There is a directness to this work, and yet, the fragmentary nature and moments left intentionally unresolved suggest a state of uncertainty and flux, inviting you to question the ambiguity of each exchange. I aim to describe familiar situations that smolder with an underlying tension. These ordinary encounters describe the yearning, discomfort, and uncertainty that feel all too familiar. I hope to draw you in, but keep you at arm’s length. To Go Unnoticed is brought to you in partnership with Red Arrow Gallery. More images available here. “The Void and the Eye” represents my desire to make conscious the awareness that everything is connected. The void represents the unconscious and the eye represents conscious awareness. I feel, acutely, the pain of being separated from my ancestors and the spirit world, the pain of separation from nature, etc., and I am trying to heal that wound in myself through my work. My inner world is a visionary world, and draws from many traditions, archetypes and symbols. Shadow work, the collective unconscious, facing our own darkness, protection, the power of love, finding balance, and WATER are themes for many of the mixed media works. What we are seeing in our own lives and on the world stage is this struggle of “dark versus light” made manifest. This “wetiko” energy threatens to subsume us, but it also is what is waking us up. We must use our creative potential – our imagination is our greatest human asset – to consciously evolve and envision a better world. 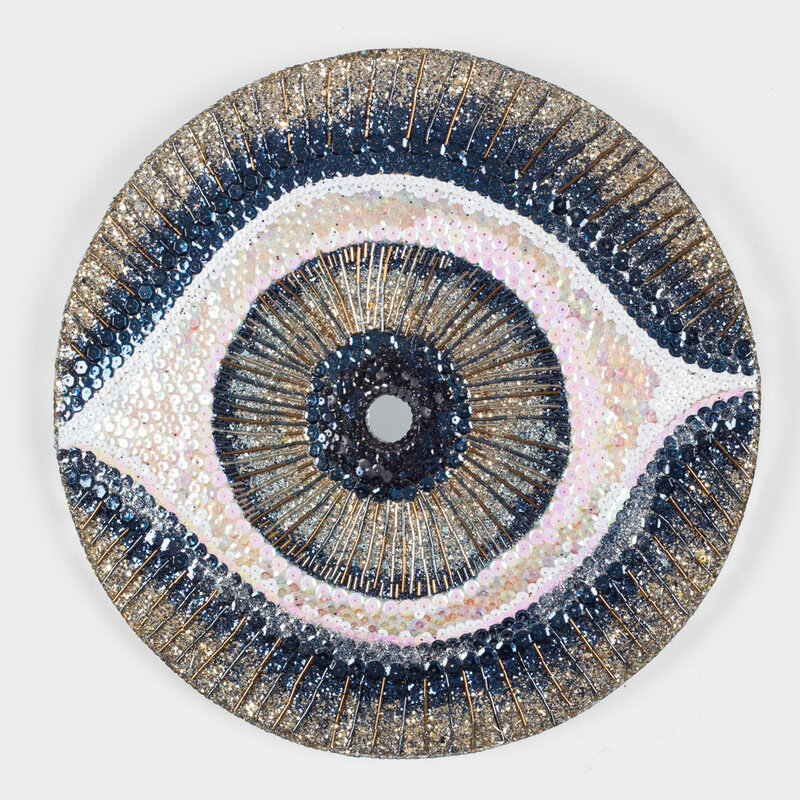 These eyes are meticulously constructed with mostly sequins, and as most of the sequins are placed one at a time by hand, the work itself becomes a form of meditation. Each eye has it’s own inner eye – a mirror in the center – to extend the idea that these are pieces intended for meditation and reflection. I chose to work with sequins because they reflect light and are fairly easy to control. Each small, dazzling dot becomes something more, something substantive, when it aggregates into a bigger whole. Just as a lone individual may feel powerless in their actions, many people aligned to a specific purpose, can collectively accomplish anything. A portion of the proceeds of the sale of each eye will be donated to the Southern Poverty Law Center. Painter Noah Saterstrom relocated with his family to Nashville in the last year or so. His newest body of work bravely explores the well-documented history of a prominent slave owning family that inhabits a branch of his family tree. I hesitate to summarize Noah's statement (see attachment) regarding this show. I will say that my heart rate spiked when I laid eyes on his work for the first time. He is by far one of the most prolific, dedicated and inspiring painters I have had the pleasure to work with. 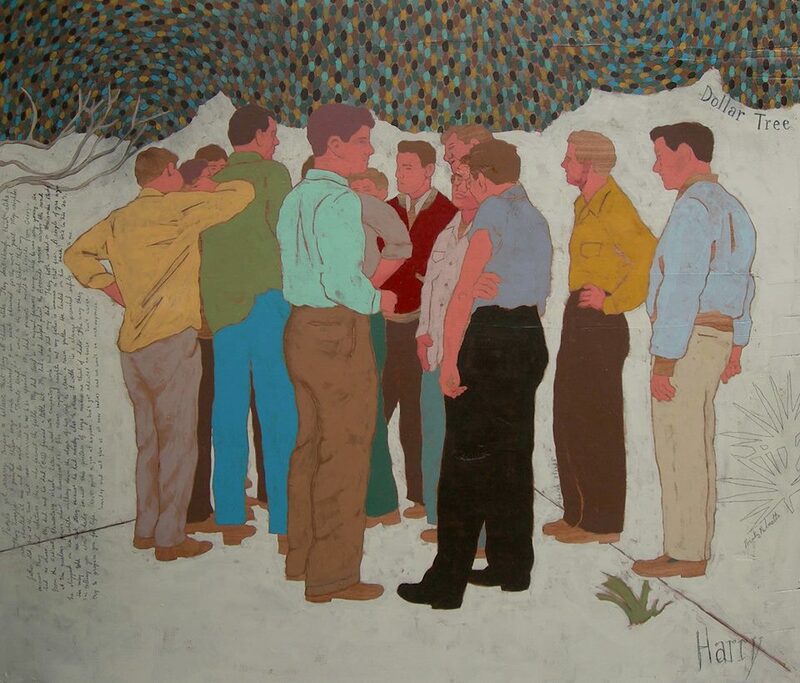 Dunson is a prominent figure in Nashville's art community and a true painter's painter. 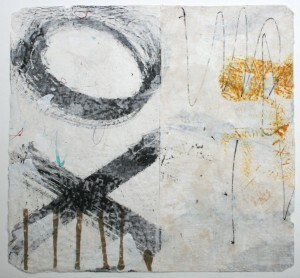 Each artist handles material - both studio and ethological - in a way that speaks to the other. In this case, quite literally. This exhibition brings these two accomplished mid-career painters together to participate in groundbreaking visual dialogue. Samuel's piece, a direct response to Noah's "In Times of War", will be revealed on opening night along with a number of collaborative works on paper. Kring's newest body of work experiments with surface texture as metaphor. Kring's masterful techniques nod to the tradition of Face Vessels and Toby Jugs. His use of contemporary themes with overt references to madness and danger make John Waters' late great Goddess, Divine, the perfect subject. You can almost smell the perspiration as each figure, so weathered and life-like, conceals a sea of neurosis just beneath the surface as though it may explode through their pores at any second. David Kenton Kring is a full-time sculptor and ceramicist, living and working in Lexington KY whose work is collected nation wide. His body of work also includes functional art in the form of hand thrown vessels and dishes that will also be available throughout the month of December. Rebecca Green's illustrations act as lanterns, shining glints upon everyday stories otherwise clouded by shadow: the shadow of the mundane. This exhibition, ILLUMINE, will feature work created to celebrate and illuminate the hidden but magical stories shrouded in the mask of the ordinary. Though each piece sprouts from an actual account, Green takes the stories into enchanted realms, where everyday occurrences blend with imaginative possibilities. Alex Lockwood, Rob Matthews, Julia Martin, Samuel Dunson, Alex Warbel, Brett Douglas Hunter, Devin Goebel, Elizabeth Williams, Jeff Stamper, Jodi Hays, Joseph Love, Josh Elrod, Merrilee Challiss, Megan Kimber, Michael McBride, Noah Saterstrom, Olivia Hill, Trevor Mikula, Seth Prestwood and Will Morgan Holland. Click here to see all works from the show. Each crusty layer of paint contains a composition that will never be seen. Intentionally covered up by either frustration or a flurry of gestural marks, these sheets of colors, patterns and shapes are embedded in the wood grain waiting to be revealed. A flathead screwdriver and an etching needle scribe replace the soft brushes for the excavation. While using these tools to dig channels into the pigment, flakes of paint gather on each side of the line. Scrapping, scratching and sanding the surface fuse the coats of paint into unpredictable designs and textures. It is within this blurry atmosphere that an imaginary world begins to take form. The environment and characters fade in and out as the images come into focus. This vignette tells an open-ended story with clues buried and tucked within the thick oily residue. I am inspired the most by nature. I love looking at trees, rocks, dirt and the creepy, crawly creatures that inhabit these lands. Having spent the past year building large scale processional puppets and participating in the Nashville International Puppet Festival, there is no doubt that the “puppet” has entered my psyche. After a long hiatus of working primarily in mixed media, my return to ceramics has found me staring back at clay heads resembling the puppet. I wonder why? It is hard to let them go. Puppets, material objects, contain and express things of mind and spirit, often controlling those who seem to control them. My newly expanded understanding of the puppet leads me to believe in the spirit that emerges during its construction. Imagining the puppet serves as a metaphor and a tangible expression of what it means to be human. Lisa Weiss returns this May with a fresh, diverse new body of work. 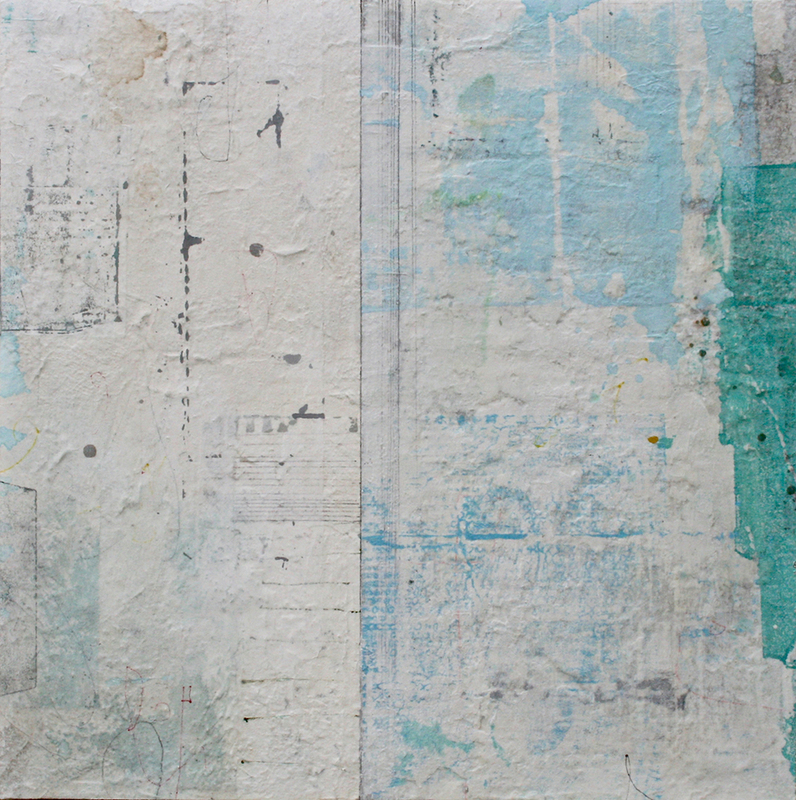 Maps explores the relationship between structure and looseness, concreteness and impermanence. Architecture, sky views, maps and symbols all inform these rich, textured, mixed media compositions. Weiss' work continues to evoke a powerful sense of peace and balance. Dedicated to the 20 year career of boxing legend Muhammad Ali, Kevin Guthrie continues to use his preferred medium of crayon and pencil on repurposed beer boxes to render portraits of all 61 of Ali's opponents. Each of these gentlemen have a unique story and they often get overlooked in the pantheon of boxing lore. Click here to see images of the show. Exploring the realms of painterly abstraction, Reynolds and Murphy both create complex, visual narratives. Murphy's sculptural prints and multimedia works use texture and illusion to create immersive environments, while Reynolds' paintings are organic mathematical reflections of personal mythologies and responses to both natural and man-made experiences. This new body of work explores the shifting internal strata of self, and how that shifting creates a distorted view of the world. The distortion results in a search for ground or hope for a higher entity -- earthly or celestial. The new year kicks off with a phenomenal group show previewing what's to come in 2016 at Julia Martin Gallery. Its going to be an exciting year with loads of new talent and solos from some of our region's top makers. Join us for our opening reception of the Group Show Preview this Saturday, January 9th, 6-9p. In the ghost town that was Lower Broad 25 years ago, my mother had me in tow as we stepped into a room packed with liquidation furniture, roughly a city block wide. My teenaged apathy shattered the minute I laid eyes on what I now know was a replica of Matisse' Spanish Woman with a Tambourine. After much pleading, it took the place of both that year's birthday and Christmas presents. I could go into detail about my education - the year I spent at the now defunct School of Visual Arts in Savannah, GA (a saga unto itself) or the listless year I tooled around Middle Tennessee State University - but the truth is that "Matisse" painting brought me online. I was given a solid foundation by some incredible professors and I know I am a stronger artist for it, but when it comes to being an artist, once you've been shown how the tools work the rest is up to you. My life's work is dedicated to creating honest, pure, elevated work that delights and engages it's viewers just like that Matisse knock-off did, which still hangs prominently in my home all these years later. I don't really feel like I am a painter, but more an illustrator of inner realms. These works represent subject matter and themes that have either entranced me (cave art, plants and animals, "journeying", fractals, psychedelic states), vexed me (witches, my own darkness), or both. Thoughts such as: "How can I represent my belief that everything is connected in an image?" and "What will the monuments that we build to Nature and her creatures, after we have destroyed it all, look like?" and "How can I address the subject of Animal Consciousness in my work?" are rattling around in my brain as I paint. All of the works are, of course (in some measure), failures on my part to communicate these ideas. The images merely document my attempts to essentially paint ENERGY, the spirit, or source energy of these attractant forces. It is only obliquely that I am able to realize anything objectively approaching authenticity. 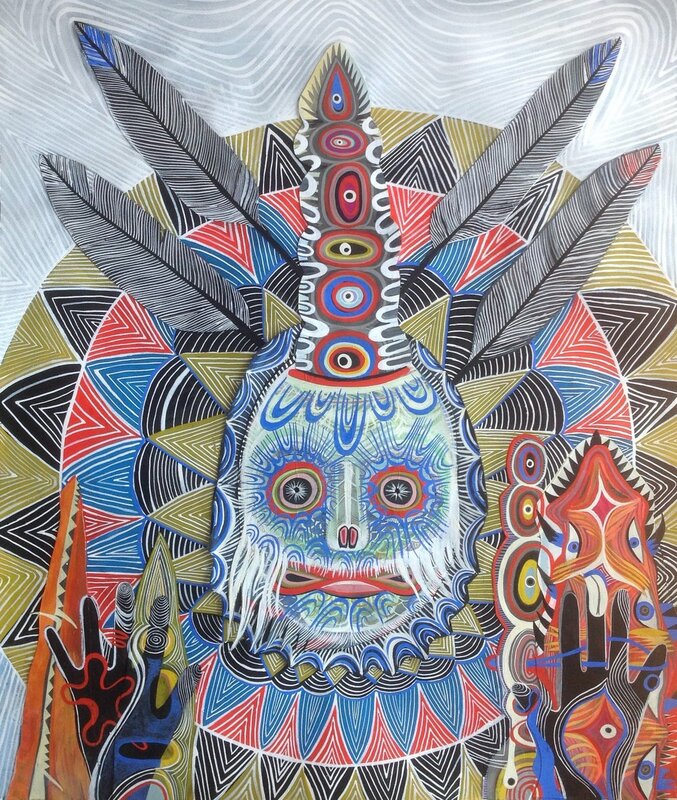 Because I use gouache, a medium more suited for illustration than painting, and because of my Alabama roots and reverence for subject matter that ranges from shamanism to EO Wilson, to the philosophy of Timothy Morton, I am, at best, effecting a kind of Southern Gothic-Psychedelic-Pennsylvania Dutch aesthetic. As I work, I aim to extend the connection with source energy by entering a state of flow or trance state, by turns anchoring and transcending (by obliteration) the image with strokes applied in rhythmic staccato. I am drawn to the mysteries of nature- from the dark corners of lonesome mountains to the bellowing call of stormy skies, there is an all-encompassing presence, an unspeakable force that is found in wilderness. At its essence, nature is paradoxical- it can be in one moment, a healing shroud and in another an unforgiving fury. I am there, often at that crossroads, drawn to the shift and to the greater pulse of the hidden world that surrounds. In my work, I find myself exploring the relationship between darkness and light, both in the physical construct of each piece and as a ruling theme and metaphor. From sketch to fully conceived, Lonesome Mountain is a collection of work that passes through various approaches and mediums, ever seeking these themes. In all, with a nod to the power of fable and folklore, I strive to stir the fantastical elements of the hinterlands alive. 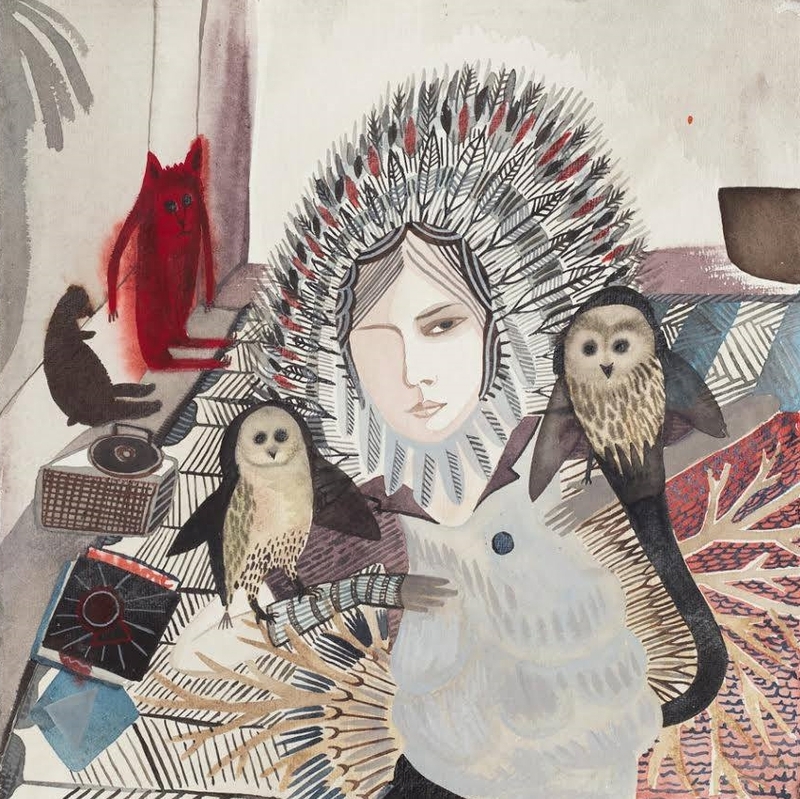 Paintings, illustrations and animations invite the viewer into the expansive unknown where humanity responds imaginatively to the spirit of the natural world. A limited edition of small press books and prints are also be available. hap.pen.stance is essentially about meditation through mark making and the balance between working with expressive forms while maintaining simplicity. Retaining vibrancy while remaining peaceful is necessary to me in painting and in life. Movements that inform gesture, repetition and pattern bring me into the moment, exploring random coincidences and diversity of form to create a unified whole. Worn and weathered marks, recalling the passage of time, evoke mystery and speak to an overall sense of awareness. My hope is for this body of work to spark the viewer awake, provoking heavy thought with a bit of levity for the grist mill. 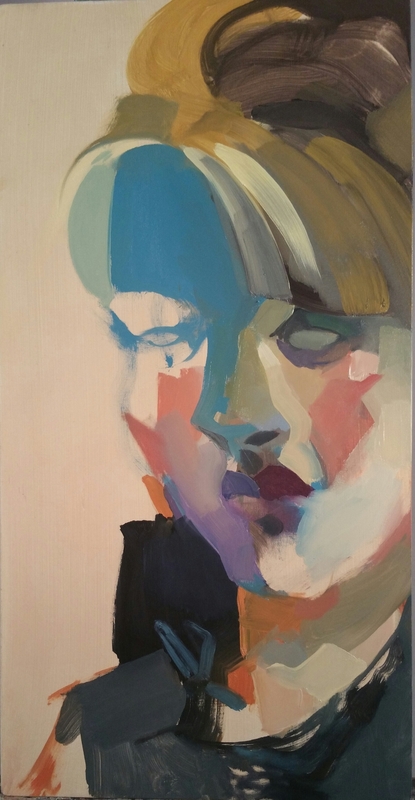 Lisa Weiss’ work draws you in with a Zen-like magnetism. I was fortunate to include her in JMG’s first group show last summer.Her work was so well received, it shocked me to learn that this will be her first solo exhibition in Nashville. I am honored to host this seasoned, sage of an artist in her first Nashville solo. Domesticity is an exploration of relationships and home life through the depiction of animals and household objects. Where previously my work referenced the past and my attempts to control it, these pieces embrace the shifting boundaries around contemporary home life and the acceptance of my own domestic relationships filled with it’s constraints, freedoms and of course dishes. The work explores normative gender roles by combining animals with ordinary household objects, reshaping the way animals are traditionally domesticated. I am very pleased to host Michael McConnell's first exhibition in Nashville since the days of our beloved and long lost TAG Art Gallery. He has always been a favorite of mine and the two pieces I own are among my prize possessions. I hope you will join us on August 1st in celebrating this wonderful artist while he is in from San Francisco, CA. Reynolds recently relocated to the east coast from Portland, OR and her work is truly a breath of crisp clean air. Described as living satellites, these intimate works on paper can only be described as masterful in their simplicity as they are in reality incredibly complex. "Paperwork" features mixed media works by four artists: Megan Kimber (Birmingham), Merilee Chalis (Birmingham), Rachel Briggs (Nashville) and Julia Martin (Nashville). Many pieces in the show bring together the human and animal instinct, juxtaposing figures and avian elements with a dark twist.